In 1992, after holding out more than a year, my wife and I finally broke down and went shopping at WalMart. Back then we were living in rural western New York. We were active in the local Greens organization and had vowed not to shop at the new Big Box store. It was not just because the Greens thought we should "Think globally, and act locally". It was because we had lost a friend to WalMart. The friend was an older fellow named Richard who lived nearby us. He was a retired farmer who needed some extra income. He always had a great interest in animals, an was expert in reptiles. In front of the barn next to his home he set up a sign reading "Po' Folks Farm". His business was selling pets, including snakes, lizards and turtles. He also sold pet supplies. His bread and butter was selling bags IAMS pet food. IAMS was a quality product that was otherwise unavailable in the area. We were occasional visitors to Po' Folks Farm. Between bags of pet food, he dispensed humor and a great deal of knowledge about the care of animals. Richard noticed his business taking a nose dive after the WalMart opened on the strip, ten miles away. People were still coming by to ask questions about the care of their pets, but they were not buying much of the pet food. Some loyal customer eventually told him how cheap the IAMS was at WalMart. Richard couldn't believe that WalMart was selling cheaper than he was buying from his wholesaler. He went to the distributor to straighten things out. They told him to take a hike. He found he had no buying power. 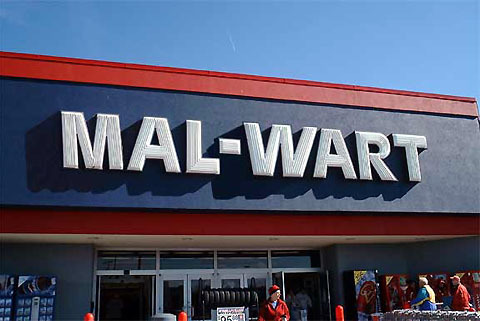 WalMart was buying for thousands of stores at a time. They could squeeze the vendors, and the vendors could squeeze Richard. Richard wanted to keep what was left of his business, so he began secretly buying pet food at WalMart and reselling at cost. Needless to say, that did not last long. We went to Po' Folks one day and the pet barn was closed down. Richard's daughter told us he had suffered heart failure and was in the nursing home after a stroke. He had been depressed. As a result, we rededicated our commitment not to shop at WalMart, ever. Maybe we could have stayed away had internet shopping been around then. The next summer we needed a camping tent and we wanted to see it and feel it before buying. We tried every outlet in the area: the hunting supply stores, the sports equipment store, the outdoor recreation store. Nobody had what we wanted, or seemed eager to get it. With some embarrassment we finally snuck off to WalMart. After reviewing a wide selection, we got a Coleman tent - made in China - real cheap. Subsequently, we began infrequent trips to the retail giant. We had become Big Box consumers. The sprawl on the suburban strip continued to grow. The WalMart became a Superstore and spawned a Sam's Store. A Big Kmart and Home Depot were added within a mile. The two grocery stores in our village closed, as well as the lumberyard. The hardware store changed hands and the new owners began running down their stock. We had to drive thirty miles round trip for any groceries, medicine or household supplies. We literally had to burn a gallon of gas to get a gallon of milk. In 2001 we moved to Kauai. Once here we found a ongoing debate about Home Depot coming to Kauai. Some people argued that Home Depot would put other outfits out of business. Supporters said the Depot would just sharpen competition, and lower prices to consumers. We befriended Bob, the manager of Hale Kauai, at Whaler's Brew Pub on Saint Patrick's Day, 2003. Hale Kauai was our favorite lumberyard and we asked Bob, with some concern, about the upcoming impact of Home Depot. He assured us that Hale Kauai was ready to go head to head with Home Depot, and would continue to provide the specialized service Kauai had come to expect. Well, Hale Kauai lasted a couple months after the Home Depot opened. We never saw Bob again. At this juncture, to stay competitive, the Big Box Store strategy is to build a new round of bigger super stores. The idea - You'll never have to shop anywhere else for anything. It's the economy of scale, all over again. Hence, the proposed WalMart SuperStore expansion. The Big Box business model relies on a fragile supply line from the Far East that culminates in huge regional hubs here. The hubs are dependent on consumers driving long distances to buy anything. Many suggest this distribution model will be unworkable in a very short time. The predicament of our consumer economy is that we really can't afford to burn a gallon of gas to buy a gallon of milk. If we continue to try, the American Dream will simply become a nightmare. Without getting into an argument over the details; let's allow for a discussion based on two assumptions. • ONE - the supply of crude oil is dwindling and that prices are likely to continue on an upward trend into the future. • TWO - there is not enough acreage (or topsoil) in America to grow grain for our food and the bio-fuel needed to run our cars as we do today. What are the implications of these two assumptions? Any economy based on cheap transportation will falter and the Big Box Biz will struggle and die. When gas is expensive permanently, even greater economies of scale will not overcome the cost of energy. Once we pass through that margin of profitability, we will be left to deal with the crumbling facades, leaky roofs and weed infested parking lots of Big Box flops. After a forty year run, another way to do business will emerge. What will another way of doing business look like? Something we've seen before... Main Street America. In many places on Kauai we could live that way again. From Kekaha to Hanalei, in many of our small towns, the infrastructure we need exists. My wife and I do most of our shopping at the nearby Eleele Shopping Center. Eleele has the only McDonalds west of Kukui Grove, an Ace Hardware, Subway Restaurant, Big Save Supermarket, as well asf other independent businesses. Eleele is close enough that we can either walk, ride a bike or drive there. Just this week, we noticed a sign there announcing a branch of Long's Drugs would be opening there soon. My wife and I were delighted. On our infrequent drives to Kukui Grove one stop we make is a visit to Long's for some specialty items. We are hoping the Eleele branch is responsive to our stocking requests so we can save some trips to Kukui Grove. The Big Saves, Subways and Ace Hardware Stores are pretty well distributed around Kauai. But in addition, if each town had a Long's Drugs and Radio Shack there could be a significant reduction in automobile traffic for shopping. Businesses like Radio Shack and Subway need occupy only a small footprint on "Main Street" and still make a profit providing services that customers want. These franchises operate thousands of small stores across America. As recently as the 1990's some chains, like J.C. Penny, ran catalog stores. These were small outposts with some display of sale items but virtually no stock. They were neighborhood places you could order items that you saw either displayed, advertised or in a catalog. After purchasing, you could pickup that item on a subsequent trip. With the introduction of internet shopping, and shippers like Federal Express, that business does not make much sense... but a variant might work. For Big Box corporations it could be a new way of doing business. They are not shy about innovation. One of the things that made WalMart the retail powerhouse it is was development of satellite communications from each store to its centralized headquarters in Arkansas to monitor every item it sold, in realtime, down to the brand of gum you bought. This gave them unrivaled marketing and inventory savvy. I recommned the Big Box Biz re-invent itself. For example, WalMart could partner up with UPS and bring their expertise together on creating "Micro WalMart" service to general stores on Main Street America... and Kauai. WalMart could use the existing stores as warehouses. From there, everything they sell should be deliverable the same day to much smaller stores in your town (or in the case of a plasma TV, deliverable to your door). This could eliminate the necessity of driving a car across the island to shop. The store would come to you, rather than the other way around. Let's call these kind of Main Street distribution chains "Little Box" stores. If successful they could invigorate small town life by making your neighborhood, once more, a place to shop and open your own business. If approved, the county's Big Box Bill could save us some grief. It would be a terrible mistake to waste time, space, money, and dwindling resources just to accommodating the last gasps of these retail dinosaurs. On our tiny island, we should encourage them to abandon the gas guzzling by thinking small and local.